He was the son of Albert W. Pernell and Henrietta Duke. [S325] Franklin Times Obituary, 17 Nov 1999. [S294] Unknown name of person unknown record type, unknown repository, unknown repository address. [S522] The Daily Dispatch, 18 Jan 2009. 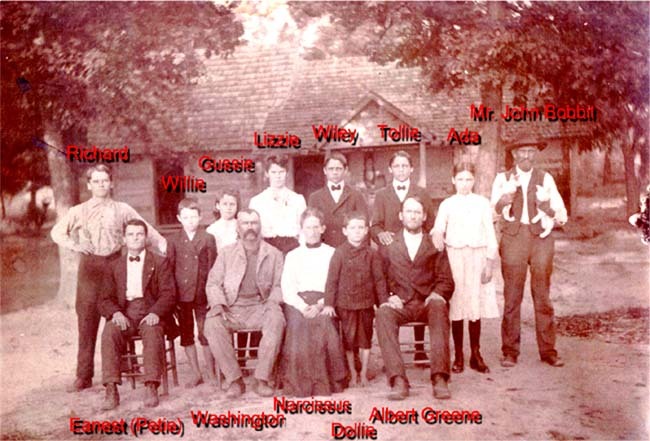 He was the son of Green Pernell and Fannie Ayscue. [S20] Unknown volume, Franklin Co., N.C. Birth Register, Register of Deeds Franklin Co, NC Courthouse. [S2363] Unknown volume, Pierce Co., Wash. Marriage Certificates, www.Ancestry.com. Birth*: Katie Frances Pernell was born on 25 June 1904 at Franklin Co., NC. She was the daughter of Albert Green Pernell and Rebecca Hamm. Marriage*: Katie Frances Pernell married William Haywood Murray, son of Joseph John Murray and Martha E. "Patti" Falkner, on 21 December 1924 at Sandy Creek, Franklin Co., NC. Death*: Katie Frances Pernell died on 25 August 1985 at Vance Co., NC, at age 81 . [S1181] Unknown author, Franklin County Heritage N.C., pg 118. [S2099] 1940 Franklin Co., N.C. Census. She was the daughter of Hugh Franklin Pernell and Annie Elizabeth Harris. Marriage*: Margaret Ereline Pernell married James Ashley Strong on 27 November 1971 at Orange Co., FL. Death*: Margaret Ereline Pernell died on 7 August 2002 at FL at age 74 . She was the daughter of Hugh Franklin Pernell and Susan Falkner. [S1111] Unknown volume, Sampson Co., N.C. Death Certificate, unknown repository. [S1182] The Franklin Times, 17 Jan 2012. She was the daughter of Albert W. Pernell and Henrietta Duke. [S12] Franklin Co., N.C. 1880 Census, pg 548. [S133] 1900 Franklin Co., N.C. Census, pg 236 a. She was the daughter of Robert Henry Pernell and Lillie Myrtle Hoyle. her husband Washington George Faulkner and children.